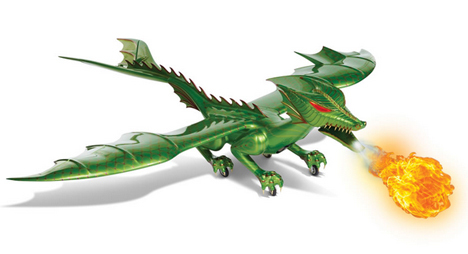 The kid in you is likely to flip out when you realize that you can now own your very own flying, fire-breathing dragon. The miser in you is sure to cringe at the enormous price tag. Hammacher Schlemmer, well known to be purveyors of the impractical and extravagant, have introduced this magnificent remote-controlled beast. 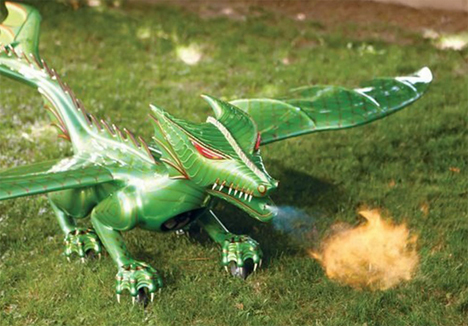 The dragon weighs in at 40 pounds and 20″ high. Its four clawed feet hide rubber wheels for landing and for steering while on the ground. 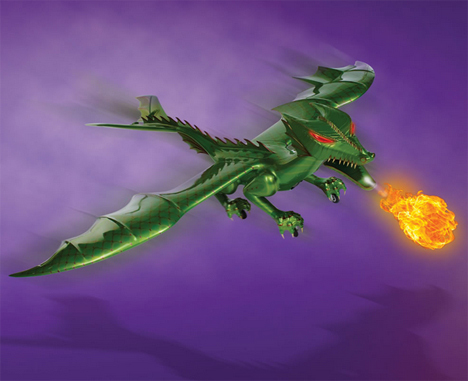 The lightweight but sturdy flying machine can do turns, climbs, and dives in the air. For just half a gallon of jet fuel (!) or kerosene you’ll get a 10-minute flight, which should give you just enough time to realize that you could have spent that $60K on a luxury car. See more in Various Gizmos or under Gadgets. April, 2014.